"What would it look like if everyone were doing the work they loved, what they felt called to do? What if everyone had the opportunity to build their skills to their maximum capabilities and then apply them to making their communities whole and beautiful?" * Good summary also here! "A Mutual Aid Network (MAN) is a new type of cooperative that pools and stewards value and rewards good work with cooperative economic tools such as timebanking, business-to-business mutual credit, and cooperative saving, lending and investment models. The goal is to create an infrastructure that empowers people to come together for common purpose and generate, share and steward the resources needed to realize their common goal. This infrastructure will support networks that overlap, connect and share with other networks operating under common principles and using similar yet varying tools and approaches. We have incorporated a cooperative registered in the state of Wisconsin, which has excellent cooperative law and history. This establishes the framework for future MANs. The Mutual Aid Network (MAN) framework can be adapted to any size, for any group of people choosing to join together for common purpose that fits agreed-upon streamlined core principles and standards. So you could make a Wisconsin MAN, a neighborhood MAN, a MAN for artists who wish to support each other, a global MAN to develop and steward the infrastructure needed by local MANs… more detail and examples here. We aim to help establish at least six pilot sites in different locations around and outside the US. The team that has developed the MAN concept to date, Time For the World, and the initial MAN pilot sites will create the legal infrastructure to enable additional MANs to form easily, providing templates of needed agreements and documents for easy localization. Each MAN site will be expected to assist new sites, smoothing the way for more rapid spread, improvement and replication. The mission of Mutual Aid Networks is to create means for everyone to discover and succeed in work they want to do, with the support of their community. The community uses timebanking, mutual credit, shared resources (like tool libraries, shared equipment and supplies) and cooperative saving, lending and investment models (like the Mission Asset Fund in San Francisco, JAK bank in Sweden, and New Zealand timebanks’ Savings Pools) to generate, steward and allocate resources toward the group’s agreed-upon goals. All of these models and tools are currently in use around the world, all with success to varying degrees. Facilitating leadership, resources, and skill development within a community to meet its own self-identified needs in a manner that generates and sustains healthy, human-scaled community and economic development. Essentially, providing groups of people with the skills and resources to come together to develop and implement projects and share the wealth they generate. Using trans-local learning and sharing to rapidly improve, replicate and scale. This means that all MANs will actively share their processes, tools, outcomes and improvements, and support each other in their efforts. It also means that each local MAN has access to a much broader array of expertise and resources than it would were it only local. Create ways to harness the value inherent in communities in ways that generate more collective wealth and rebuild the commons - indigenous community economic development." 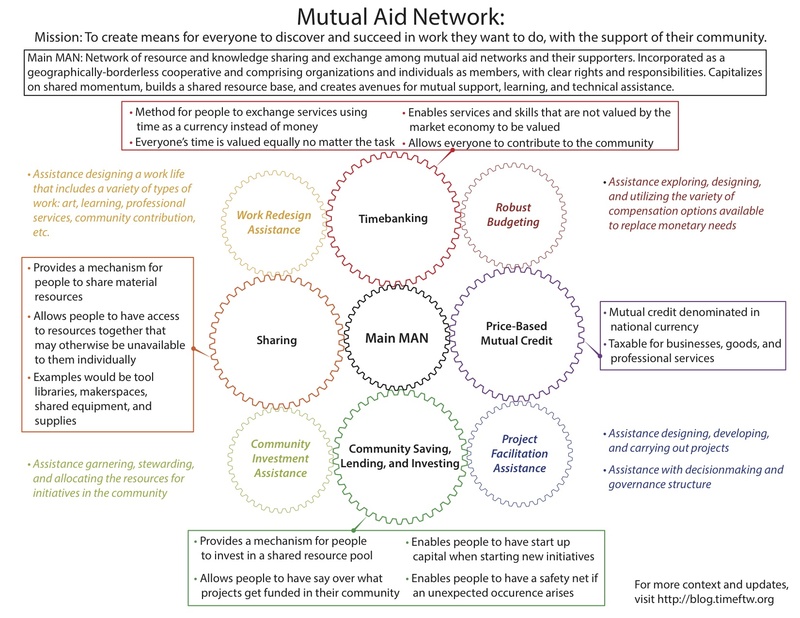 "The Mutual Aid Network is a cooperative designed to pool and steward value and reward good work with cooperative economic tools such as timebanking, business-to-business mutual credit, and cooperative saving, lending, and investment. We are working to create an infrastructure that empowers people to come together for common purpose and generate, share, and steward the resources needed to realize their common goals. Initially, the Mutual Aid Network is intended to help you discover the work people you are connected to share and are involved in. Over time, and as you connect additional networks, The M.A.N's recommendations will improve." "The Mutual Aid Network (this site) is an attempt to construct a framework to facilitate location-specific and location-non-specific projects and collaboration. This is a gradual experiment, trying to rethink some ideas about resource pooling, reciprocity, and exchange. Some of the things we are looking for help with include feedback on design (concept, interface, architecture), software development assistance, copy writing, outreach, and funding. We are definitely interested in hearing other ideas for contributions, though. A current high priority is to modify Matthew Slater's Community Accounting module to allow other types of entities (like projects) to be trading partners: https://drupal.org/node/2041227. This will make it easier for people to get credit based on contributions to projects, and to give credit to projects we find particularly useful. We see this as a way of representing work done for a commons. Other aspect of the Mutual Aid Network, including templates for localized structures and agreements, will be developed via other projects. This project is specifically focused on tech and web aspects of the project." A Mutual Aid Network (MAN) is a new type of cooperative that pools and stewards value and rewards good work with cooperative economic tools, such as timebanking, business-to-business mutual credit, and cooperative saving, lending, and investment models. The goal is to create an infrastructure that empowers people to come together for common purpose andgenerate, share, and steward the resources needed to realize their common goal. This infrastructure will support networks that overlap, connect and share with other networks operating under common principles and using similar yet varying tools and approaches. We have incorporated a cooperative — Wisconsin Mutual Aid Network Cooperative (WIMAN) — registered in the state of Wisconsin, which has excellent cooperative law and history. This establishes the framework for future MANs. The Mutual Aid Network (MAN) framework can be adapted to any size, for any group of people choosing to join together for common purpose that fits agreed-upon streamlined core principles and standards. So you could make a Wisconsin MAN, a neighborhood MAN, a MAN for artists who wish to support each other, a global MAN to develop and steward the infrastructure needed by local MANs…more detail and examples here. We aim to help establish at least six pilot sites in different locations around and outside the US. The team that has developed the MAN concept to date,Time For the World, and the initial MAN pilot sites will create the legal infrastructure to enable additional MANs to form easily, providing templates of needed agreements and documents for easy localization. Each MAN site will be expected to assist new sites, smoothing the way for more rapid spread, improvement, and replication. The cooperative members use timebanking,mutual credit, shared resources (like tool libraries, shared equipment and supplies) and cooperative saving, lending and investment models (like the Mission Asset Fund in San Francisco, JAK bank in Sweden, and New Zealand Timebanks’ Savings Pools) to generate, steward and allocate resources toward the group’s agreed-upon goals. All of these models and tools are currently in use around the world, all with success to varying degrees. Vision:People being put to their highest and best use. Communities equipped and empowered to create their own problem-solving, community, individual and human-scaled economic development projects, i.e., people everywhere from every walk of life doing work they love, contributing to their communities as they wish and working with neighbors to solve problems and realize dreams. Mission:To create a global network of many-size, many-function cooperatives that takes inspiration from the Mondragon network of cooperatives, with an explicit aim that every member can get their basic needs met within that network while doing work they choose and/or create. Objectives:Form the legal and financial structures that support the mission, create template agreements for cooperative members to adopt, create work opportunities and compensation options that match both the types of work conducted and the needs that need to be met, apply these structures to meet community goals such as brownfield remediation, community self-sustainability, wellness, energy independence, mutual support, etc. Provide resources that facilitate technical assistance and support in meeting the above goals. Mutual Aid Networks may be formed for any purpose agreed upon by the members of the cooperative, in keeping with core principles and practices of the MAN as incorporated. Individual members designing their own program of good work and free time, to be compensated in a variety of means including Hours, price-based mutual credit (MC$), in-kind resources and money from the pool. Cooperative-created or -approved projects. Projects will be approved by an agreed-upon protocol and process, ideally near-automatic with clear principles and guidelines provided by the MainMAN. A cooperative, organized in the US with explicit simple standards for international affiliation and regional and local spin-offs and partners. We often have ideas of what we’d like to do in the world, or things that we think should happen to make our communities more livable, vibrant, fair, etc. We tend to lack the time or other resources (money, help, skill sets, etc) to do these things. A cooperative structure can give us the legal and financial infrastructure to commission work from other individuals or groups in order to make these things feasible. Additionally, the Rochedale Cooperative Principles, including reciprocity and cooperation among coops, when applied to the global network of cooperatives, help to alleviate the global problem of shifting financial, human, and environmental costs to players in other communities or countries. The fractal design of this cooperative structure creates opportunities for an infinite array of entry points for individuals and groups, appealing to their existing individual motivations. Basic core principles include cooperative principles, governance of the commons, and principles of co-production. Creative Commons or like licensing and open data sharing is also essential. The MAN will provide tools and technical assistance for dynamic governance or other highly participatory models. Why? The establishment and adoption of structure and governance processes for cooperative stewardship and allocation of resources provides tools for all participants to learn and practice common ownership and wise, fair, and efficient resource allocation. – used to catalyze, facilitate, and reward contributions to commons, mutual aid, and support. Why? It is often difficult to meet the material and labor needs of any given project with money, and the pursuit of monetary contribution often requires the use of time and help which could be more effectively used toward project goals. And the pursuit of monetary resources often requires compromise or excessive paperwork on the part of project organizers. Thus, many worthy projects never occur due to lack of funding. In the MAN structure, timebanking is treated as adequately abundant (no debit limits as long as reciprocity or contribution to the commons are offered). It is good at facilitating cooperation, collaboration and sharing, discovering community capacity, bootstrapping the resources (skills, time, talents, unused resources) of a given network to accomplish a particular goal, applied toward meeting the basic needs of everyone in the network, including the very vulnerable. TimeBank Hours (Hours) will be paid out by projects accepted by cooperative members, under agreed-upon criteria (should be clear, simple and near-automatic process), one Hour per hour needed to conduct project. Hours will circulate under accepted timebanking terms: One hour is always worth one Hour (in any increment needed) and can be exchanged with any other member voluntarily on the same terms. There is no legal guarantee of the value of Hours, no monetary equivalent and pricing only happens to the extent that goods are priced based on the time taken to produce, obtain or exchange them, agreed upon as fair by all parties to the exchange. Any material goods needed to complete a timebank exchange are paid for separately, by the recipient of the service. Material goods needed for a project will be obtained in-kind or through the Community Supported Resource pool. Hours will be paid out for any work or item that is sufficiently, or infinitely abundant. Hours may also be obtained by individuals or organizations by “Buying Time” – see below. (MC$) will be credits exchanged in the same mutual credit system as timebanking and will be denominated in dollars for ease of pricing and accounting. They will be recorded as cash transactions and taxed according to all applicable laws. Backed by goods and services, MC$, will have debit limits suited to the goals of the particular network and reflecting the relative scarcity of the resources being exchanged. MC$ recognizes and accommodates the realities of scarcity, competition and market while improving liquidity and creating incentive for local sourcing and cooperation among local market-based economic players (small-to-medium enterprises). It also facilitates greater availability of highly professional services within a given MAN, facilitates greater accessibility to goods within the network, creates a taxable mutual credit system to fulfill needs that must be met in the marketplace (protecting timebanking from the tax question). MC$ will be used for business-to-business exchanges, professional services that cannot be offered in the TimeBank for licensing, tax or other purposes. MC$ accounts will carry credit and debit limits agreed to by members of the cooperative, with guidelines and examples provided by the MAN network. MC$ can be obtained through earning from other organizational or individual members, or by “Buying Credit” – see below. will be a broad resource base available for exchange on terms agreed upon by all parties to the exchange or allocation, including land, appliances, office supplies, food, buildings, machinery equipment and tools, in a manner formerly referred to as bankftw and laid outhere. Plus money in a simplified JAK-bank and slow money- inspired system of community saving, lending, granting and investment. “Buying Time” A cooperative member may invest in their community’s system by choosing to accept compensation for a percentage of their working wage. They commit that percentage of their wage to the CSR money pool. For that amount of their work time they accept Hours from their affiliated MAN’s project. Hours are taken out as the work is conducted. Once the wages are contributed to the pool they are controlled by the cooperative – the Buyer of Time has given all rights to the money to the cooperative and is instead being compensated with Hours under the standard terms of Hours use. This helps to resolve the problem that many people who have high-paying jobs lack time to participate in the community time-based economy. By creating the option to ‘buy time’ we can create an opportunity for workers to replace some of their money-paid work with time-paid work while avoiding a need to partner with each employer or to jeopardize employers’ standing in labor law, or an implication of disrespect for labor laws. The money pooled through community members ‘buying time’ helps to create a healthy balance of resources available to members whose work may be less able to attract monetary compensation. “Buying Credit” Any cooperative member may invest in their community’s system by exchanging money for MC$ at a dollar-to-dollar rate. Once dollars are exchanged for credit they are managed by the cooperative and the credit-buyer no longer has individual claim to them. MC$ function under consistent terms no matter how they are obtained. This page was last modified on 4 June 2017, at 16:03.